Students have one hour of food technology per week in Key Stage 3 at Upper Wharfedale School. They then have the opportunity to continue at Key Stage 4 with Vocational Qualification in Food and Cookery, should they wish to do so. Throughout their time at school, we aim to encourage independent learning through practical participation. We want our learners to have a wider understanding of healthy eating and give learners the opportunity to develop a range of skills and techniques. These skills and techniques will then enable our learners to be able to prepare a variety of dishes. Thus, ensuring that our learners leave Upper Wharfedale with vital life-skills. Year 7: Students focus on the basic skills relating to health and safety within the kitchen environment. This unit looks at the basic health and safety within a kitchen environment. Learners are able to identify hazards, enabling them to be able to keep themselves safe. Knife skills are taught (Bridge & Claw). This unit looks at the Eat Well Guide, learners will focus on the five sections of the guide and how they fit into our daily diet. This unit develops the deeper understanding linking to the Eat Well Guide. Learners look at how different nutrients work within our bodies to maintain a healthy body. This unit looks at the different dietary needs/requirements linked to different age groups. The unit also looks at the fourteen allergies that people can develop. This unit introduces learners to different foods from around the world, learners look at what each country grows/eaten as their staple food within each countries diet. Year 8: Students will continue to develop their knowledge and understanding of food preparation skills. This unit will look at the nutritional information found on food packages. Learners will look at how this information can be used to influence they choice when buying food products. This unit learners will look at the different types of flour and how this can have an impact of the finished bread product. The learners will also look at Yeast Investigation using a simple experiment to enforce their learning. This unit learners will look at the different types of raising agents and link this to the function of cake making. This unit learners will look at the different types of eggs which consumers can buy. The different uses that eggs have within our diet and the different cooking methods that eggs can be used for. Year 9: Students will build on their prior knowledge of practical skills and explore the world of international cuisine linking to Social and Moral issues around foods. This unit learners will look at the different foods around the world and will build on their prior knowledge. Learners will look at the cultural cuisine which is available to them locally. 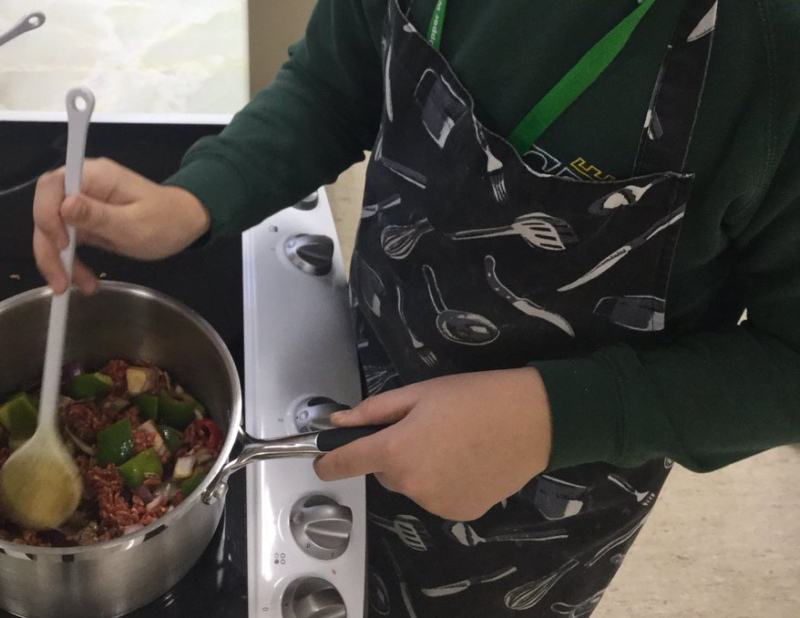 This unit learners will build on their prior knowledge linking to the variety of international dishes and the variety of cooking methods required to produce these dishes. This unit learners will look at how the preparation and presentation of their dishes has on the consumer. This unit learners will look at how replacement products for meat are a good source of protein and why there is a media campaign to get consumers to try these meat replacements products. NCFE Level1/2 Technical Award in Food and Cookery. The award is designed to provide pupils with the skills, knowledge and understanding of the applied study of good food and cookery practices and an understanding of working in the catering sector. LO1 Understand health and safety relating to food and cookery. LO2 Understanding food and nutrition. LO3 Understanding factors that affect food choice. LO1 Understanding preparation and cooking skills. LO3 Understanding how to plan and produce dishes in response to a brief. LO4 Understanding employment opportunities within the food industry. KS3: All students are formerly assessed at the end of each topic. These are in form of teacher feedback and verbal feedback, peer and self-assessed. KS4: All students complete each section of the components of each unit. Each component is marked to the exam board criteria, either internally or externally, unit depending. KS3: Due to the practical nature of Food Tech homework will be set as/when necessary. KS4: Homework will on be set during preparation for the external exam. The remaining coursework will be completed in controlled conditions in school. All students are encouraged to enter into the Rotary Young Chef of the year competition held in November. Students have to produce a two-course meal from a fixed budget. Students compete in Local, Regional and National Finals. Within our own local community, linked to friends of the school, we have a cooking competition. Students have to produce a three-course meal. The winning menu is cooked by the students and customers vote for their favourite course.